If you’re looking for a meaningful way to give back to the community, we humbly suggest supporting your neighborhood Castle! We’re looking for volunteers to donate their time and talents to the Joslyn Castle’s docent program. Joslyn Castle docents lead historical tours and chaperone events when called upon. They provide a welcoming atmosphere and promote a deeper understanding and appreciation of the Castle background, ensuring visitors a memorable experience. 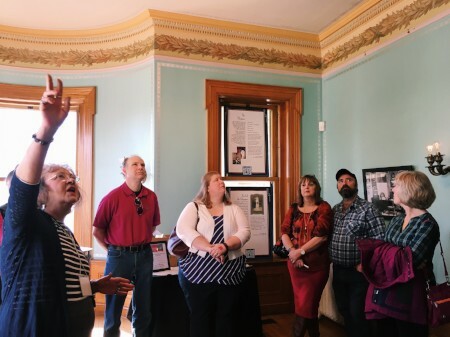 Docents focus on enhancing the visitor experience by leading interactive, interesting tours and sharing valuable information about the Castle and the Joslyns. Click to read the full Joslyn Castle Docent Job Description. Thank you for your interest in volunteering with Omaha’s Joslyn Castle! If you're interested in volunteering at the Joslyn Castle, please fill out the following form and a staff member will be in contact shortly.